.458 SOCOM, .450 Bushmaster, or .50 Beowulf? For no particular reason (maybe its just the season); recently, I've been considering a large caliber upper for when the mood strikes. Not really interested in a dedicated rifle, just an upper to fit on a 5.56 lower. Thoughts? One other question. Which red dots would you recommend to handle the recoil? I have had the "urge" for a thumper, but so far have managed to resist. I think if I did give in, it would be with the 458 Socom.....or in second place the 450 Bushmaster. I like the speed demons of the thumpers! I love my .50 Beowulf but damn it was expensive to get into and develop a decent cheap load. It kicks the hell out of everything. I like the .458 socom but it doesn’t do what the Beowulf does. I feel my 7.62 battle rifles can cover the .458 socom need. The Beowulf is like a semi auto 45/70 with max loads. I've had my Beowulf over 20 years. Don't take it out much but it's great fun to shoot when I do. I can only speak of 458 SOCOM and 450 Bushmaster. In straight walled restricted states the SOCOM round gets left out of the picture if hunting is what you have in mind. The Bushmaster takes a bit more care in selecting magazines the will feed reliably. Aluminum and plastic mags lack enough feed lip strength to hold back a full stack and will send rounds flying every which way if bumped. Steel have worked quite well for me with a bit of tuning. For a hunter on the go, or for a non-reloader, the Bushmaster can be found nearly everywhere. SOCOM rounds feed better from mags and chamber better due to the bottle necked cases. And it hits hard and suppresses well too. Better have plenty on hand for an outing because ammo is hard to find if you run out. The 50 Beowulf is something I have no experience with. I would think that the lips in a steel magazine could easily handle the large diameter case. Here is another cartridge that you need to make sure you have brought enough on a outing. All three are thumpers and are effective at rearranging anything hit with one. Considering bullet selection, case availability, ease of reloading, mainstream availability, and performance expected will determine which is best for you. I always used EOTECHs on my builds. You pays the money and makes your choice. I just took advantage of the Primary Arms sale on .458 SOCOM barrels and bought a couple. Totally an impulse buy though and no experience and little knowledge of the cartridge. I will get a bolt and carrier from somewhere, Brownells has them for a little over $100, and I already have an upper receiver that is not being used. Then a gas block, a muzzle device and a few other small parts and I can put it all together. I have found ammo for about $42 a box. Why got involved in another project, I don't know. As stated before Beowulf and Bushmaster are straight walled. The Beowulf probably has the shortest effective range of them. I bought my Beo upper at one of the Black Rifle Conventions held back in the early '90s after myself, my girlfriend and another couple ate dinner at the same table as Bill Alexander and his chief engineer (don't recall his name, though he was from H&K). This was before they were selling complete rifles and only uppers at the time IIRC. [QUOTE=Gazz;4656091] I will get a bolt and carrier from somewhere, Brownells has them for a little over $100, and I already have an upper receiver that is not being used. Be warned that those large caliber thumper rounds need to have enlarged ejection ports for fired cases to pass though. You will have to modify your own or purchase one made to accommodate the larger size. Tromix and others sell them plus has drawings for the do-it-yourselfer. Thanks for that tip! I have an upper that has no forward assist and was made without provisions for a dustcover so should be easy enough. I considered the cost of building a straight cased ammo rifle, but chose to buy a NIB Ruger AR-556 MRC in .450 Bushmaster. Cost was around $750. It is a well built rifle, and I appreciated the beefer bolt and chamber profile. the rifle also comes stock with a two stage trigger compared to RRA and Larue. I found that building an upper would run me around $500, give or take, excluding shipping (and time). Taking into consideration the lower with decent trigger and Magpul furniture (… also a MIL-SPEC receiver extension), $750 was a good buy. I was pleasantly surprised by how mellow the .450 Bushmaster round is to shoot! I really enjoyed zeroing it, despite crappy weather, and laying in the grass/mud on a buddy's private property (40 degrees and rain, but it was the only chance I had before hitting the wood line next week). The rifle comes equipped with a carbine weight buffer, I am looking forward to playing around with heavier buffers and springs to lighten the recoil (thought it isn't really necessary). 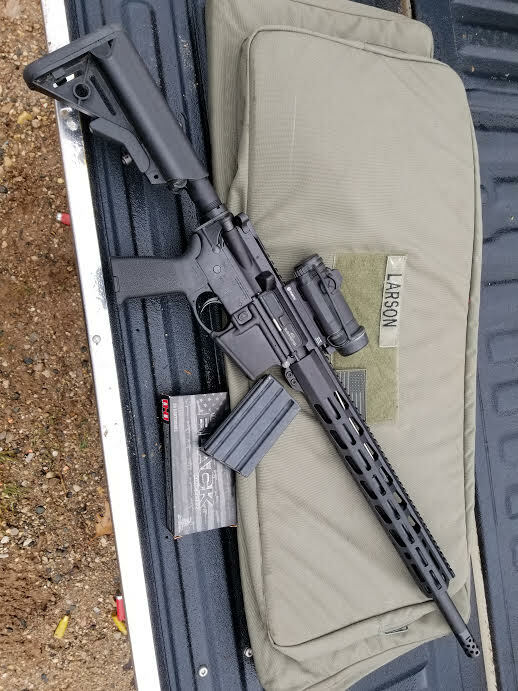 I tossed on an Aimpoint that I pulled from another zeroed AR to speed up zero time. I also tossed on an old KAC Sop-Mod buttstock (creature of habit). The .450 Bushmaster is a FLAT shooting round! I launched my first round at 25 yards, made a mild adjustment and went straight to 100 yards. Shot three rounds, made another minor correction. Laying prone off a rubber block in the rain, with the Aimpoint, I confirmed a final three round group and called it a day! The ACS Magazine that came with the rifle worked flawlessly. It isn't just a 20 round 5.56 mag with a different follower in it. Considered all, now have two 458 SOCOM's and waiting for Form 1's to return to finish another pair. I run them 90% subsonic but plan on setting one up as a supersonic gun once get all four completed. Will most.likely be the longest barrel 458 SOCOM of the group. 330 grain Barnes TTSX are wicked destructive and a 550 grain JSP still makes huge energy at 1,050 fps plus the bottle neck design feeds and extracts very reliably even inna nasty rifle from suppressor blowback. I have no experience with 450 Bushmaster and don't recall anything about it. I have shot 458 SOCOM and 50 Beowulf, full auto as well. I expected both cartridges to shoot the same and was more interested in the 458 SOCOM thinking it would be cheaper to reload for. After shooting them I did not like the 458. It was obnoxious and just didn't feel right. The 50 Beowulf of course is a big thump of course but smooth and I liked shooting it. Myself with what I have seen I would buy the 50 Beowulf, but always open to new ideas. While I am not a fan of anything made in the Philippines then branded with a big logo that says AMERICAN TACTICAL imports in a manner most see the AMERICAN very boldly and the "made in Philippines" only if you hunt for the fine print LGS has sold a boat load and never seem to have one of their AR 15 or scatter gun designs come back with any complaints and why always a few on the wall due to price point and getting folks out the door with a complete rifle instead of a lower and dreams of ordering internet parts. We have an ATI AR 15 on the wall right now in 450 Bushmaster that will go out the door for $599 all taxes included and probably a box or two of ammo with a little negotiating. I understand the 450 Bushmaster is deer legal in many states the 458 is not plus get a couple hundred more ft/lbs of energy but energy at subsonic velocity is my thumper goal. Since my number one use for a thumper was subsonic suppressed have gone with 458 SOCOM and not looked back. Have a can waiting on a BATFE Form to come back that has a very good baffle design, two inch internal diameter and eight inch internal length. Have all my math done so that when form comes in can tack the can to an 8.5" barrel and have 16.1" from bolt face to end of can. Right now running subsonic through my AAC Hybrid can from a 10" 458 SOCOM it's quiet. So quiet that have been working on buffer and bolt noise as that along with sound of 400 to 550 ground bullets striking the target are my largest hurdles. Already got a lot of that worked out with a Tubbs Flatwire Spring, M16 Clinic buffer pad, lapping bolt run inside of upper and more. Still the AAC can is a bit overwhelmed but believe the new can is going to have enough internal volume and baffle design that will pretty much have bullet strike sound pressure being the loudest part of the system. A 400 to 500 grain bullet at 1,050 fps does exactly what I want it to do. Now have more 6.8 spc II's than I can accurately count without going to the list which have all the horsepower I need in a poodle shooter running supersonic. The 300 BO is useless to me as it just doesn't have the juice subsonic to slay zombies with authority or carry any real energy full power and seen too many folks blow up 5.56 rifles with 5.56 headstamp converted 300 BO ammo even though it takes a lapse of reasoning seems to happen often. When I want a real thumper just grab one of my AR 10's in 338 Federal and they will thump the ever living crap out of about anything I need. Had an excellent opportunity to go with 50 Beo when scored over 500 commercial cast, 300 commercial jacketed projectiles and several hundred cases in an estate deal but was able to sell the cases and projectiles for most parts needed to build another 458 and gave away the cast bullets here. As mentioned above for Gazz's benefit the big bores need different ejection port sizes to chunk out the shells. First one I built I opened up the port on my upper on my mill but since am using the DPMS heavy walled uppers with no forward assist or dust cover doors for extra meat in the uppers in case I decide to run a few mag loads of binary fire with full power ammo. Put a binary in one of my 458's and the one touch double taps are impressive even with subsonic. Brownell's sells the DPMS properly designed upper and a nice HPT/MPI shot peened bolt and carrier group for way cheap most of the time. Now have my fleet of 5.56 and 6.8 AR 15's which niche needs are filled by four 22 Noslers and soon to have four 458 SOCOM's and may call the poodle shooter game over except for occasional special builds and working at LGS. For the OP who asked about building a 450 Bushmaster upper may want to carefully price all your build parts and may be able to buy a complete rifle for same price or within a hundred bucks and not have to move uppers and worry about gas system settings, buffer weight, etc. More an upper is moved the more steel pin on aluminum receiver wear is accelerated though it's a seldom discussed issue except with the precision shooting crowd. I have seen multiple flyers for the last several weeks where you could buy a 450 or 458 upper with the oversized ejection port receiver w/o bolt,carrier and charging handle for less then $200. A couple of years ago, I made a promise to myself to not add any different cartridges to my reloading stable and I have been pretty good about keeping it. The "thumper" AR's have been my biggest temptation so far! Based upon reviews, many of these inexpensive uppers and barrels are a gamble. It appears that a number of them come from a single source and rebranded, with many poor reviews. Then you still have to add $$$ or BCG (and a crap bolt can also sideline a build), lower ect., muzzle break, decent trigger, furniture, the Ruger for $750 pans out as a solid deal. The Ruger also comes with the beefier chamber and bolt with rounded lugs, which I have found to be a smart move.... it takes some energy to chamber that large round from.the magazine. I'm very pleased with my purchsse.... highly recommended. Here in Michigan, we can only use straight case ammo during rifle season, hence popularity of .450 Bushy and .50 Beowolf. I took a large doe night before last for the freezer.... .450 Bushy rocked.it. Blew the heart to pieces, made a mess of its shoulder at exit, leg hanging off by skin. Fielding Hornday Black. Currently sitting in the blind waiting for a.buck! Congratulations on your kill this year. I think you did yourself right with that Ruger purchase. A friend bought the Ruger bolt gun for hunting and was initially disappointed with it. Didn't like the plastic stock. Once he got the optics mounted and did the sight in, he was like "HEY!, this thing shoots". Still couldn't convince him to run with it, though. He wanted me build him up an AR like the other guys. So with a new barrel and an assemblage of parts out of the parts bin, he got his wish. Tagged a nice nine point buck at 80 yards with it yesterday. He says he couln't understand wtf was going on. Hit it with a broadside shot and the buck did a little shiver then took a few more steps. Hit it again and it stopped and wobbled. Fired one more and it was lights out. Last nights autopsy showed first shot took out bottom half of lungs. Following shot exploded heart. Third took out plumbing in it's neck. Damn thing was a zombie that didn't know it was dead. A little patience would have netted results after the first hit. This was his first experience with a semi-auto and he liked it a wee bit too much. It's nice to have quick follow up shots available, but damn, easy on the bullet hose. Hunting ammo used was the Hornady black factory stuff. Performance was considered to be very efficient and effective by the troops. Comparison to the 12ga slug loads was described as every bit as deadly with the shotgun hollow point being more explosive internally. 450 wound channel was just as deadly but without excessive tissue damage to good meat when the hollow point falls appart. Waiting for three more hunters to report in. Michigan season is off and running and 450 bushies are evrywhere. My next door neighbor hunts with Remington 742 in 30-06 and does not stop shooting till deer hits ground or magazine runs dry. Most were dead upon first shot just not smart enough to fall down so got four more rounds scattered through bodies in the meantime so they look like hit by an A-10 tank buster with 1/2 the meat ruined. Won't recount shooting a deer with a 350 Rem Mag where 250 grain bullet entered chest/shoulder as almost facing me and exited the opposite rear hip turning all internal organs into soup and ruining shoulder, one side of ribs and rear quarter. Now quite happy dropping them with one shot into ear canal with my 22 Hornet. Only damage is trickle of blood from ear and their eyes bug out of their sockets. I witnessed a head shot via a 7mm magnum. Shot was taken close range walking back to truck, and when partner fired at the head peeking through the brush, all I saw was the red mist explosion with both antlers flying off spinning in opposite directions. Damnedest thing I ever saw. I just ordered a Bear Creek Arsenal 18" complete upper in .450 BM for deer hunting here in MI. In rethinking my bullet choice in my black powder rifle - which is what I hunt with in both firearm and BP seasons - I found talk of the .450 all over FB in an outdoor group. Looks good and looks to work well. A friend's wife took two bucks within a few minutes of each other with her .450 AR. Looking forward to getting it sorted out and hunting with it next year. I'll hunt down a mag or two and find an optic to put on it, most likely a red dot or small magnification scope. I'll also be working up a new load for the BP rifle. I'm going to go to the Barnes Expander MZ 195 gr saboted bullets. I'm shooting a .45 cal that I want better terminal performance out of. Reports back from the field covering the three 450 Bushies I built up for friends are all a thumbs up. Ranging shots taken from 40 to 180 yards and accuracy reported to be spot on. All hits were from either DRT to 50 yards and drop. Three nice bucks and then another full harvest for the doe cull season. DNR pushing for a much reduced deer herd to fight off that wasting disease threat. Internal damage to organs was reported to be of the "train wreck" class to the targeted area, yet less tissue damage with surrounding muscle mass. Less blood trail was noted in some cases, but considering how far they could move after being hit, was not an issue. One shot taken passed through the boiler room and exited in shoulder blade area leaving devastating destruction to the joint as it passed through. Michigan hunting requires a straight walled cartridge case for deer hunting. That's why 458 SOCOMs aren't used here. Scarcity of ammo and cost per round precludes the 50 Beowulf usage. 450, while not cheap, is still a bargain compared to those Winchester 12 gauge sabot slugs. Perfect meat on the table medicine for Michigan Whitetails. I love that stuff. Last six deer I have shot used a 22 Hornet into ear canal. They drop DRT with trickle of blood from ear and eyes bulge out. Neighbors don't even notice the Hornets. I have the build at the shooting stage and took it to the range. First thing I find that it does not feed well, or should I say not at all, from the few AR magazines that I tried. The cartridge gets about halfway there and stops the bolt. I am shooting Xcaliber 300gr HRN JHP rounds and I did buy a proper upper receiver for the .458 with an enlarged ejection port as well as a .458 bolt anf carrier from Brownells. If I drop the magazine when the jam occurs, I can withdraw the bolt a bit and the cartridge straightens out and gets loaded properly when I let go the charging handle. I fired two rounds this way and the first ejected okay while the second got shoved back into the chamber so I have some unsticking to do. I will try a few more magazines but wonder if I need to do some feed ramp polishing. Rounds that have jammed and were not fired show a small flattened area on the bullet nose. Any ideas on what may fix this? Pictures of the jam before cleared and deformed projectile on round after removed may help diagnose your issue. Feed lip break in is probably the culprit causing issues. Sharp edges dragging on soft brass slows down the works considerably. Smooth edges will improve the loading process. Best magazine/follower combo to use is 10 round Lancer magazines with the Tromix aluminum follower. This will net you a four round magazine that works about the best of any ever used. Parts can be had from Tromix.com as well as a write up to optimize same. A little polishing of the underside of the feed lip edges helps reduce friction that inhibits smooth loading. Four rounds of those fat bodies precludes inserting a full mag into a closed bolt. Ar15s are just not made for these thumpers. Got to the range for a bit today and tried a few more rounds through it. I did grind away part of the upper receiver feed ramp as it was taller than the one in the barrel extension and figured that can't be good - its all nice and smooth now. I have been putting only two rounds in a magazine to test and when I let the bolt go on the first round, it chambers just fine. The problem now seems to be an inability to eject a fired case as I'm getting stove pipe type failures. after getting home, I found the gas block to be a little loose so I maybe get short cycling from leaking gas. I'll try again tomorrow. You did use an upper with oversize ejection port for the big thumpers? Unsure if that would cause feeding issues but will lead to ejection issues. I do all.the recommended tricks during build process based on lots of research before built my first thumper and all have worked fine with a bit of gas and buffer tweaking. Yes, an upper receiver with the large ejection port specifically for the .458. I also thought about the buffer and spring and wondered if they might need any tweaking. What kind of gas tweaking are you speaking of? The lower I am using runs .223/5.56 just fine. If feeding it plenty of gas then a heavy buffer may help slam those rounds home. What length barrel, what length gas and what is port size on barrel? Need to wrap brain around how much gas your feeding it in relationship to dwell time. If have a heavy buffer laying around or in another rifle give it a try. Two of mine have Slash Heavy Buffers. I put the .458 upper on a carbine lower - adjustable stock and carbine buffer - with some success. 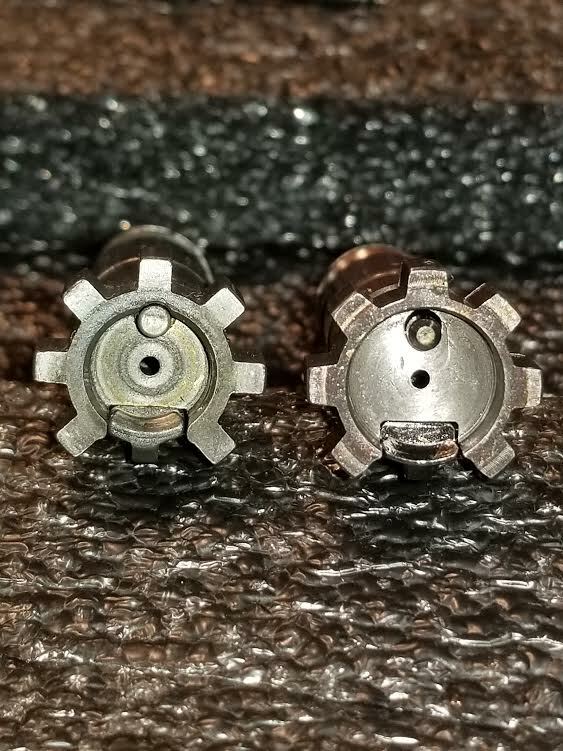 Still trying with only two rounds in a magazine and both fed properly, fired and ejected but the bolt did not lock back on the empty magazine. The empties basically dribble out the ejection port and are right there on the bench. Glad I don't have to chase them but it needs more robust ejection I think. The gas port in the barrel is .086". Another two rounds in different magazine produced a failure to feed on the second round. The round was half in the feed ramp and half in the magazine with the bolt behind it. Are lighter buffer springs made or do I start lopping coils off? Actually, I think I need all the power in the buffer spring to help with feeding. More gas?